Low Carb BBQ MeatLovers Pizza | Keto Recipes! Pizza has definitely become one of our staple quick and easy meals. The best part is that once you have practiced this recipe a few times, You can make it so many different ways just by changing the toppings But keep in mind when adding toppings to count up all the carbs you are adding. Each slices comes out at roughly 3.5g carbs, 27g fats and 18g of protein. Your macros will vary depending on your toppings! Preheat oven to 400F and put 2 cups of mozzarella cheese into a microwave bowl. Microwave the cheese until it melts like so. Try not to melt too much as cooked cheese will go brown and hard. This took around 45 seconds in my microwave. Add 3 tbsp cream cheese and 1 egg to the cheese and mix it in well. Spread it out onto non stick baking paper or Baking Liner and try to get it as round as you can. Cook in the oven for 10 mins. Then take it out, Flip it over (Carefully! We placed another piece of baking paper on top and carefull flipped it over. But it’s easier if you use a Baking Liner) and bake for another 5mins. Then cover in your favorite Toppings! 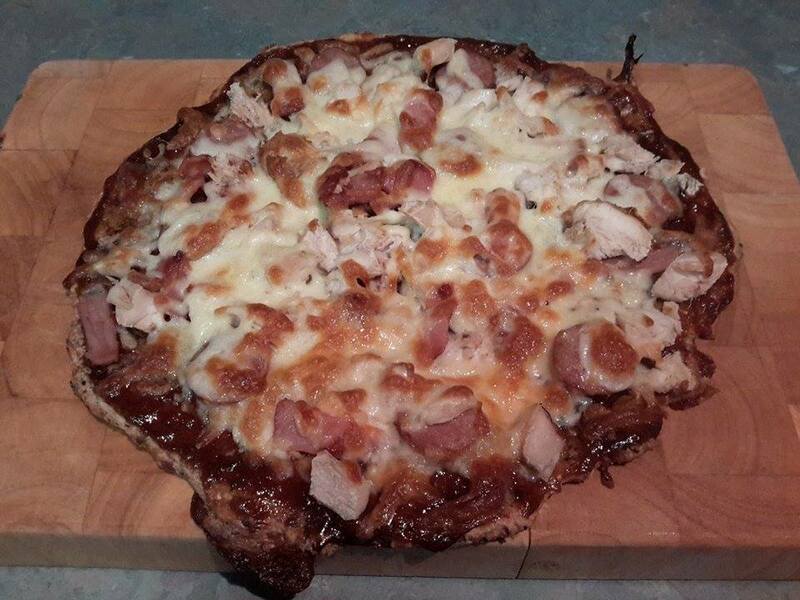 We used, Chicken Pieces, Bacon, Kabana, BBQ sauce and more cheese! Then bake until cheese is golden brow, slice serve and enjoy!